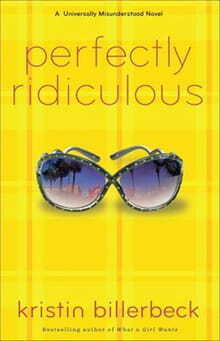 In her third and final offering in the Universally Misunderstood Novel series, bestselling author Kristin Billerbeck, maintains chic, relatable prose as she details the life and times of teenager Daisy Crispin. Billerbeck creates a modern-day cast of colorful characters with dialog that could easily be plucked from Legally Blonde. While reading all three books in the series consecutively would certainly help connect the dots of character development, Perfectly Ridiculous can easily be read as a stand-alone novel. Billerbeck does a superb job of crafting a lead character who’s relatable, approachable and likeable, yet flawed. Heroine Daisy Crispin is a typical teen girl wrestling with real insecurities, raging hormones and valid anxieties. Although her home life is eccentric (Her mom is obsessed with sewing and makes all of Daisy’s clothes, and Daisy’s bedroom is in the garage where her mom stockpiles toilet paper. ), the problems she faces and the choices she makes are relevant to most teens. She’s constantly comparing herself to her best friend, Claire, who seemingly “has it all” because her family has money. She’s trying to be her own person and break free from her overbearing parents. And she’s confused about where she stands with a certain boy… Is he a friend or something more? Daisy is a ham, and Billerbeck’s humorous firestorm of dialogue is guaranteed to engage readers for all 200-plus pages. This novel finds Daisy at a crossroads. She’s finally made it through her awkward high school years, and she and Claire are counting down the days until they leave for their all-expense paid trip to Argentina—a graduation gift from Claire’s dad. Not only are the girls planning on staying at a five-star resort for a vacation filled with pampering, but Daisy’s “sort-of” boyfriend conveniently lives in Argentina. All is going according to plan, until Daisy receives a letter from Pepperdine University stating she has to complete two weeks of mission work in order to fulfill her scholarship requirements. So what was once a relaxing vacation evolves into a trip filled with less-than-desirable conditions, hard work and a dose of reality. And to make matters more interesting, at the last minute, Daisy’s overprotective parents agree it isn’t safe for the girls to travel alone and decide to go with them. Just when she thinks it can’t get any worse, Daisy is relegated to “snack duty,” and finds herself under the careful scrutiny of the mission coordinator who inexplicably has it in for her. The result is a ridiculously outlandish adventure where Daisy comes out of her shell, realizing who she is and what she wants. It takes traveling to another country for her to realize her life isn’t so bad after all. But it’s not without plenty of detours. Daisy spends the majority of the story obsessing over the one thing every teenage girl obsesses about—boys. Max is the boy she hoped to find in Argentina, but another young man, J.C., unexpectedly tugs at her heartstrings with his Justin Bieber hair and puppy dog smile. J.C. and Max aren’t the only boys vying for attention with their boy band good looks, and Daisy and Claire are perfectly giddy about it. Interestingly enough, snobby, privileged Claire is the perfect contrast to shy, prudish Daisy. Just when you think it will obviously be Daisy’s life that will be transformed on this mission trip, it’s ironically Claire who comes home with a different perspective. She’s the one who soaks in the richness of the opportunities, while poor Daisy squanders her chance to minister to others and instead spends her time analyzing her boy problems. Cleverly, Billerbeck has Daisy penning her own thoughts in a travel diary so readers are not only invited into the story but also into the depth of Daisy’s heart. There are lessons aplenty in Perfectly Ridiculous. Kristin Billerbeck feels like the cool older sister offering advice to today’s teens. And thanks to dear Daisy, girls can learn from her mistakes and relish the qualities that make her perfectly unique.